strategic merger or exit option? On 24thNovember German’s chemicals company BASF disclosed to be currently in discussions regarding a potential merger between its oil & gas business, Wintershall AG, and LetterOne’s oil & gas activities bundled in the DEA AG. Both DEA and Wintershall are headquartered in Germany. Since the outcome of the discussion is still open, there is no assurance that the transaction will take place. The only certain element is that, if the operation is successful, BASF would hold the majority of the joint venture, worth about €14bn. BASF is the world's largest chemical company, ahead of Dow and DuPont, and has more than 330 production sites. The company operates in five business segments: Chemicals, Performance Products, Oil and Gas, Functional Materials and Solutions, and Agricultural Solutions. Wintershall is BASF’s unit that focuses in oil and gas exploration and production in Europe, North Africa, Russia, South America, and the Middle East. This unit used to operate also in the transport of natural gas and crude oil in Europe until October 2015, when BAFS divested Wintershall’s trading business to the Russian company Gazprom, in return for stakes in Siberian gas fields. This swap, along with a slump in the oil price and turmoil in Libya (one of Wintershall’s key sources of oil), implied a drop in Watershall’s revenues last year to €2.8bn, from €13bn in 2015. Nevertheless, thanks to the focus on exploration and production, the unit’s profitability rose nearly threefold to an operating margin of 57%. Considering an EBITDA accounting for €1.6bn in 2016, analysts believe that Watershall AG could be worth up to €11bn. DEA AG is a German company that operates in exploration and production of oil and natural gas in Germany, Norway, Denmark, Algeria, Libya and Egypt. This company was formerly a subsidiary of RWE and was bought by L1 Energy (vehicle of Fridman’s LetterOne) for €5.1bn in March 2014, before oil price collapsed. 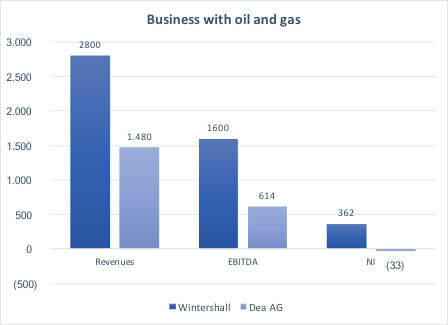 It is interesting to notice that also Wintershall was interested in DEA three years ago, therefore a merger could give BASF a chance to pick up the asset at a considerably lower price. Financial details of the merger are yet to be revealed, but this does not prevent us from providing an essential analysis of the deal. 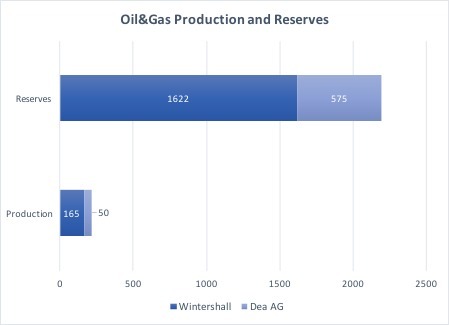 In the first place, the merger between Wintershall and DEA would result in an and oil and gas joint venture with production of around 210m barrels of oil equivalent (BOE) and sales of €4.3bn (based on 2016 company data, see charts below). The combined company will be worth approximately €14bn and BASF will be owning around 70% of the combined entity. Analysts estimate that BASF would capture €115m in post-tax synergies, and approximately €140m total synergies based on the combined current production. At a first glance, this merger could seem part of an expansion plan for BASF in the Energy industry. However, many analysts believe that this move is actually the prelude of a process of withdrawal from the oil business. The two companies are in fact considering also an IPO as an option in the medium-term: if it is true, BASF would probably reduce its majority stake in the merged business or completely divest it in the event of an IPO. This change in business strategy may look quite strange if we think that oil and gas business has always been a natural hedge against BASF’s core chemical production, which relies on both commodities. As a result, during the past two decades Wintershall has played a major role in stabilising company profitability. But since oil prices collapsed in 2015, this line of business has failed to provide an hedge to the chemical portfolio and, moreover, has also led to increased volatility in terms of cash flow generation, said Patrick Lambert (brokerage Raymond James). Therefore, the final outlook of this merger could be positive both for BASF’s profitability, that would begin exiting the oil business that now has few overlaps with the other chemical activities of the company, and for the merged company itself, that through an IPO could increase the values of its overall assets. This merger would be also consistent with the consolidation trend in the oil and gas industry, buoyed by expectation that oil prices will rise soon. With regard to the market reaction, after the talks were confirmed, BASF shares as much as 3.1 percent in Frankfurt trading, the most among the 30 largest companies on the DAX index.